In the form of a little girl, J'onn J'onzz reflects on the decimation of Pisa Italy and her people. With his powers J'onn can�hear the thoughts of pain of the victims and the Doom Patrol struggling to regain their bearings, which he cannot block out. Simultaneously he senses the pain of a family without a mother, and the greed of looters making off with a television. The Justice Society appears and immediately helps with search and rescue, recovery, and emergency medical supplies. They are met with a mixed reaction, for Black Adam was once a member of their ranks. J'onn attempts to mentally locate Black Adam, and finds him again in the midst of battle, this time in at the Parthenon in Greece against a Beast Boy-led Teen Titans. Black Adam easily bests Prodigy's attempts to restrain him. Zatarra's use of the Greek statues in his assault only angers Adam, who drives the young magician into one of his statues. Without his mind controlling them the statues become inert and Raven saves Zatarra from being crushed by one falling forward. She teleports beside Gar, who doesn't know what he should do since being a leader is usually Cyborg and Robin's department. At the same time, Young Frankenstein attempts to restrain Black Adam in a bear hug, only to have his arms ripped from their sockets. He flies off while warning the Titans to not cross his path although he does not "enjoy the deaths of children." Raven wants to help Young Frankenstein, but Beast Boy refuses to give him any assistance in light of the threat that Adam poses. This time disguised as an adult male, J'onn comes to Young Frankenstein's aid, trying to mentally calm his passing, but is instead under seige by the Titan's entire life flashing before his eyes. Also on the scene are Sasha Bordeau and Agent Faraday, arguing about not killing Adam when they had the chance. Sasha says Amanda�Waller's only in charge because "no one trusts her on ops." 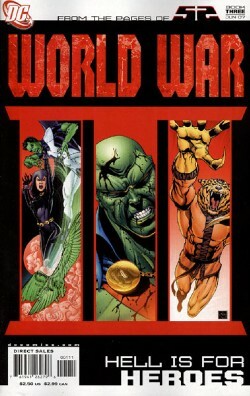 In�Detroit, J'onn can sense the confrontation between�Ben Turner and Amanda Waller, who broke into his apartment. Ben wants nothing to do with Waller's agenda, knowing she's creating a secret agency together, but then�she brings up that Captain Flag is alive and well, which changes Turner's mind.�Amanda quiets him in light of the latest news report on Black Adam's rampage in the Himalayas. The Titans - Hawk and Dove, Raven, Terra, and Beast Boy - attempt another assault on Adam, who holds true to his word about no second chances. He vents his anger at his memories of how Osiris was once a Titan until they believed the hype started after he accidentally killed someone to help his sister. In the end he blames them for Osiris' spirit being broken, which led him to let his guard down and allow the Horseman to claim him. Adam tears through Raven's magic and puts his fist through Terra's chest. Terra tries to crush him with two large boulder, but he shrugs them off and drives his fist STRAIGHT THROUGH her body! As he again escapes, Beast Boy, through Raven, realizes the Titans' best option is to regroup and attend to their wounded...and their fallen. Elsewhere, J'onn "ghosts" into Director Bones' D.E.O. Inner Sanctum, realizing with Waller and Checkmate preoccupied, the organization is the only one available to step in. By webcam, he consults with Kate Spencer, who's giving him grief for not stepping in sooner. When she demands what he's going to do about the mess, he says he'll resolve it in one hour and fifty-nine minutes. Learning all he can (which isn't much) J'onn departs. In the office of prosecuting attorney Andrew Bates, which J'onn monitors, he cuts to the chase with Kate and points out his associate Mr. Skyes has looked into items missing from an evidence locker and that it was her ID badge�used to gain entry. Spencer denies Mr. Matthew's involvement,�saying his badge could've been stolen or duplicated and pointing the finger at him without�video isn't grand jury worthy.�Bates�retorts that nothing will stop him from firing�Matthews and prosecute him unless there's something Kate wants to confess. Damon interjects, quitting on the spot and storming out of the office. Kate catches up with him, and Mattews�realizes no one will hire him with this black mark on his record. Kate informs him that Bones is setting up his own firm and she wants to hire him as a defense attorney. Kate reveals it was HER who stole his ID, saying it was "moonlighting." J'onn hears every word, and�the duality of human nature�sickens him, yet questions whether he himself is just as duplitious despite him being a martian. J'onn stops by the precinct house of Denver Colorado where he was employed as Detective John Jones. Assuming Jones' identity, he looks at the photo on his desk of Peter Santorelli, Diane Meade, and himself. Peter himself notices him and J'onn, without hesitation, drops his civillian identity, revealing himself. He's come here to confess his manipulations of truth regardless of pure intentions because he doesn't want to repeat the same mistakes and departs. He then retreats to the Terrell Building, where he set up shop as a P.I. after quitting the force. Now empty and condemned, sickened by the lies surrounding him, he lashes out with his abilities and levels it, thinking it's time for an ending. Story - 4: I'd like to start this review paying my respects to the victims of Virginia Tech, who came to mind while I was reading this issue, for whether fictional or not, the level of grief and tragedy in this series is universally felt. Although�I love the idea of making Black Adam's vengeance on the world a completely separate event from 52, I have to admit that this book is extremely graphic in its content. The man rips people apart without mercy and that doesn't exclude children like Terra. If�Ostrander's aim was to reestablish Black Adam as a major villain, they've succeeded, for not even Hal Jordan in his Parallax days was this bad. This is Joker-class evil. Scratch that, this is beyond the realm of comics-style evil. However it is not without making his motives sympathetic, as is the justification of his fury presented through Adam's tirade regarding Osiris. It's as if he gives himself incentive for fighting the Titans in the end. That, and retaining the Week and Day chronology serve well in connecting the book to 52. Still, the timing of the issue cannot be worse in light of the tragedy in Blacksburgh, Virginia. It is on the level of 9/11 corresponding with the Twin Tower teaser for the first Spider-Man movie. I'd read this week's 52 first and I was saddened that the battle(s) were limited in content. Now that we get the full spectrum of the vengeance of a man with the powers of a god, it's a mixed blessing. Its redeeming story, however, is that it's told through the eyes of J'onn J'onzz. Martian Manhunter's perfect for an outsider's perspective. Throughout the entire issue, J'onn keeps himself at a distance, even from his closest allies and friends as he tries to reevaluate his connections to humanity. The pieces are starting to fall together as to why he's abandoned his humanoid-like form and all ties with the human race. The problem with being a telepath is everyone's mind is an open book and it is easy to lose optimism in the face of such heinous thought of depravity and callousness, and gain bitterness if you let it. It is only a question of how much of his actions are the result of Black Adam's assault in the earlier issues. Has the evil of Adam corrupted J'onn's viewpoint, considering his compassion a sign of weakness and an insult to his people? It is natural for all immigrants to retain their beliefs and ethics associated with their culture, but not to the point where you become an isolationist. J'onn has deadened himself to human concerns just as Black Adam has. Ostrander seems to be establishing a commonality between the two; for the sake of the book, he's supplementing Captain Marvel with Martian Manhunter as Black Adam's true nemesis, if only on a mental level. This journey of self-discovery is written to counter the journey of vengeance. It is a struggle to say beautifully done (even�though that's the truth) because of the timing again, so you'll have to excuse my�bias. Art - 5: A comic book story is�only as effective as the art that depicts it. For this issue, Derenik and Rapmund nail it.�The shock value of Adam�literally tearing his opponents apart is captured magnificently, as are the facial reactions from his other opponents; you can feel the disheartening and loss of fighting spirit on the part of the Titans. He also does a very good job of capturing the dispairity of characters like Raven, Beast Boy, and especially J'onn. This trip down memory lane for�the Martian Manhunter is also very well done. His coming out at the precinct is as visually subtle as it was handled by the hero. Cover Art - 5: Sciver's ability to capture emotion is second to none. I've been a fan of his since Green Lantern: Rebirth. However, while the composition of three panels featuring the three main characters of the issue works, this time around it seems a little off. For starters,�Raven and Beast�Boy seem too close together. It almost looks as though Raven is trying to�hold Gar by the�neck with above-average strength. Then there's J'onn J'onzz; while we get the turmoil he's in, it's suggestive that he's committed murder,�with the blood of the innocent splashed across his forehead and chest. Then there's this tiger-like character. I didn't even see him in the issue, so where's the connection? Is it because there's a talking tiger in the Shazam series, thus retaining Black Adam's connection to the book? Unclear.�Other than that the cover still rocks, Ethan.